While we raise German Shorthairs and specialize in the pointing breeds, we offer training for all types and breeds of bird dogs. We have trained virtually every breed of bird dog, paying attention to the natural differences and abilities between breeds. All of our training is done keeping the unity of dog and owner foremost in our minds. All of our training programs can be completely customized to meet your personal styles and needs. Now taking reservations for Winter Camp 2007. We will be in Kansas from mid-January until Mid_March. Starting as puppies, we slowly and carefully introduce each dog to gunfire and birds to insure that they do not become gun shy or bird shy. 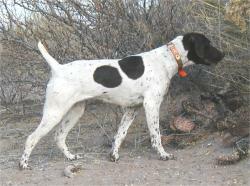 Dogs are then worked on live birds with emphasis on locating game and pointing. 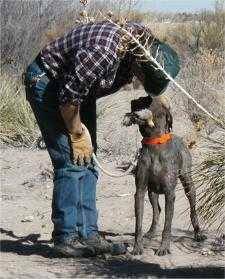 Retrieving and locating dead birds is added to the program as the dog works to enhance its natural instincts and abilities. All training is designed to be fun and without pressure while laying the foundation for future training and takes approximately one month. After their initial introductions to guns, birds, and retrieving, dogs are ready for basic training consisting of yard work and additional work in the field. During yard work the dog is schooled in basic obedience with emphasis on heeling, coming when called, and whoa. After this training the dog is prepared to go back to the field to be steadied to the flush and/or shot. In the field, dogs are steadied on point and to the gun. 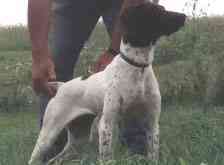 They work on handling and pattern, finding and retrieving dead birds, and backing or honoring another dog on point. Training generally takes 2-3 months but can vary greatly depending on the dog. We have trained dogs for Field Trials, Shoot to Retrieve, & National Bird Hunters competitions (where dogs compete against each other) and NAVHDA & AKC hunt tests (where dogs are tested to a standard). Dogs trained at this level are trained "steady to wing and shot" and are prepared for the rigors of competition both in body and mind. If competition is not what you are looking for, but the advanced training of "steady to wing and shot" or a "trained" retrieve would help to enhance your hunting time together with your dog, then this program would be of great assistance to you. Problems such as a dog being gun shy or gun leery, failing to retrieve, laying or sitting on point, bolting or running away, are just a few things which, if not corrected, are not only detracting but in some cases can be dangerous to your dog. Special care is required to fix these problems. The type of problem, and the ability of the dog to work through the problem, will determine how much and what type training will be required.